Hi, Is there a way to export a sensor list with limits for each sensor? I Have hundreds of temperature sensor and I'd Like to know the limits (warning/error). 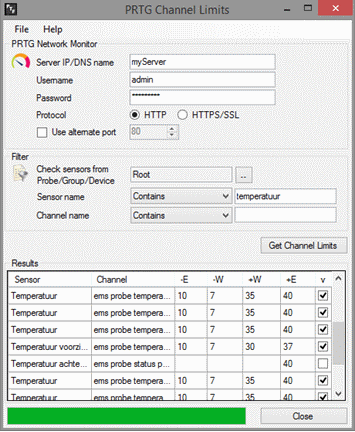 PTF ChannelLimits is an application that allows you to get an overview of the channel limits of your sensors. Have you ever wondered if you have set and activated the correct threshold limits for all your temperature or disk space sensors? Stop wondering; using this tool, you will get an immediate overview! The tool can be downloaded from the PRTGToolsFamily website here. but it's not my case. I know about the export of the sensor, but now I would like to export in fact a part of the 'configuration' of the sensors, like the limits (warning, error) configured on each. $List | Out-GridView -Title "PRTG | Sensor Thresholds"
Note This works only for sensors that have limits configured in their sensor settings. Channel limit settings cannot be read with that.